The geography of New Zealand encompasses two main islands (the North and South Islands, Te-Ika-a-Maui and Te Wai Pounamu in Māori) and a number of smaller islands, located near the centre of the water hemisphere. New Zealand varies in climate, from cold and wet to dry and to subtropical in some areas and most of the landscape is mountainous. The dramatic and varied landscape of New Zealand has made it a popular location for the production of television programmes and films, including the The Lord of the Rings trilogy. Neighbouring countries include Australia to the northwest and Tonga and Fiji to the north. New Zealand is in Oceania, in the South Pacific Ocean at . It has an area of 267,710 square kilometres (103,738 sq. mi) (including Antipodes Islands, Auckland Islands, Bounty Islands, Campbell Islands, Chatham Islands, and Kermadec Islands), making it slightly smaller than Italy and Japan and a little larger than the United Kingdom. These islands are the main areas of land that emerged from the largely submerged continent of Zealandia which came into existence about 83 million years ago before sinking about 20 million years ago. New Zealand has 15,134 km (9,398 mi) of coastline and extensive marine resources. The country claims the fifth-largest Exclusive Economic Zone in the world, covering over four million square kilometres (1.5 million sq mi), more than 15 times its land area. It has no land borders. The South Island is the largest land mass and contains about one quarter of the population. The island is divided along its length by the Southern Alps, the highest peak of which is Aoraki/Mount Cook at 3724 metres (12,218 ft). There are 18 peaks of more than 3000 metres (9800 ft) in the South Island. The east side of the island has the Canterbury Plains while the West Coast is famous for its rough coastlines, very high proportion of native bush, and Fox and Franz Josef Glaciers. The North Island is less mountainous than the South, and is marked by volcanism. The island's tallest mountain, Mount Ruapehu (2797 m / 9176 ft), is an active cone volcano. Lake Taupo is near the centre of the North Island and is the largest lake by surface area in the country. It lies in a caldera created by the Oruanui eruption, the largest eruption in the world in the past 70,000 years. Strong winds in the Cook Strait produce high waves which erode the shore, as shown in this image. New Zealand straddles the boundary between two tectonic plates. The subduction of the Pacific plate under the Indo-Australian Plate results in volcanism, especially in the North Island's Taupo Volcanic Zone. The associated geothermal energy is used in numerous hydrothermal power plants. Some volcanic places are also famous tourist destinations, such as the Rotorua geysers. The collision between the two plates causes regular earthquakes, though severe ones are infrequent. These have uplifted the Southern Alps along the Alpine Fault, and the resulting orographic rainfall enables the hydroelectric generation of most of the country's electricity. New Zealand experiences around 14,000 earthquakes a year, some in excess of magnitude 7. There are karst sedimentary rock formations, the largest area being Takaka Hill and surrounding area, and others include the Waitomo Caves and the Pancake Rocks which are recognised tourist attractions. New Zealand consists of 16 regions, seven in the South Island and nine in the North, and a number of outlying islands that are not included within regional boundaries. The Chatham Islands is not a region, although its council operates as a region under the Resource Management Act. The Kermadecs and the subantarctic islands are inhabited only by a small number of Department of Conservation staff. The climate is mostly cool temperate to warm temperate. Mean temperatures range from 8 °C (46 °F) in the South Island to 16 °C (61 °F) in the North Island. January and February are the warmest months, July the coldest. New Zealand does not have a large temperature range, apart from central Otago, but the weather can change rapidly and unexpectedly. Subtropical conditions are experienced in Northland. Peak summer temperatures are in the range 24–28 degrees Celsius, although inland Central Otago often experiences 30–34 degrees. Winds are predominantly from the west and south-west in winter, when the climate is dominated by regular depressions. In summer winds are more variable with a northerly predominance associated with the regular large anticyclones which cover all the country. Most settled, lowland areas of the country have between 600 and 1600 mm of rainfall, with the most rain along the west coast of the South Island and the least on the east coast of the South Island and interior basins, predominantly on the Canterbury Plains and the Central Otago Basin (about 350 mm PA). Christchurch is the driest city, receiving about 640 mm (25 in) of rain per year, while Hamilton is the wettest, receiving more than twice that amount at 1325 mm PA, followed closely by Auckland. The wettest area by far is the rugged Fiordland region, in the south-west of the South Island, which has between 5000 and 8000 mm of rain per year, with up to 15,000 mm in isolated valleys, amongst the highest recorded rainfalls in the world. The UV index can be very high and extreme in the hottest times of the year in the north of the North Island. This is partly due to the country's relatively little air pollution compared to many other countries and the high sunshine hours. New Zealand has very high sunshine hours with most areas receiving over 2000 hours per year. The sunniest areas are Nelson/Marlborough and the Bay of Plenty with 2400 hours per year. Westland is the region with the lowest hours at 1600, which is the same as the sunniest area (Scilly Isles) in Britain. the mountains, especially the Southern Alps. New Zealand's cities, main towns and selected smaller centres. Earthquakes are common, though usually not severe, averaging 3,000 per year mostly less than 3 on the Richter scale. Volcanic activity is most common on the central North Island Volcanic Plateau. Fire bans exist in some areas in summer. Droughts are not regular and occur mainly in Otago and the Canterbury Plains and less frequently over much of the North Island between January and April. Flooding is the most regular natural hazard. Few regions have escaped winter floods. Settlements are usually close to hill-country areas which experience much higher rainfall than the lowlands due to the orographic effect. Mountain streams which feed the major rivers rise rapidly and frequently break their banks covering farms with water and silt. Close monitoring, excellent weather forecasting, stopbanks, multiple hydropower dams, river dredging and reafforestation programmes in hill country have ameliorated the worst effects. 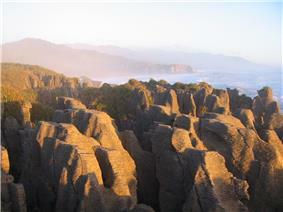 The pancake rocks near Punakaiki, a karst area formed of limestone. Current issues: Deforestation, soil erosion, native flora and fauna hard-hit by invasive species. New Zealand, and especially the Bounty and Antipodes Islands, are near the center of the water hemisphere—the hemisphere of the Earth with the smallest amount of land. New Zealand proper is largely antipodal to the Iberian Peninsula of Europe. The northern half of the South Island corresponds to Galicia and northern Portugal, with Christchurch corresponding to the coast near Foz, and northern Cape Stephens just reaching Salamanca. Most of the North Island corresponds to central and southern Spain, from Valladolid (opposite the southern point of the North Island, Cape Palliser), through Madrid and Toledo to Cordoba (directly antipodal to Hamilton), Lorca (opposite East Cape), Málaga (Cape Colville), and Gibraltar. Parts of the Northland Peninsula oppose Morocco, with Whangarei nearly coincident with Tangiers. The antipodes of the Chatham Islands lie in France, just north of the city of Montpellier. The antipodes of the Antipodes Islands lie in South West England. ^ Matthew Hall (2004) Existing and Potential Geothermal Resource for Electricity Generation. Ministry for Economic Development. ^ About 58% of New Zealand's electricity was hydroelectric in 2002. Veronika Meduna. 'Wind and solar power', Te Ara – the Encyclopedia of New Zealand, updated 21 September 2007. ^ From CIA World Factbook, 2013 edition.